Well it’s certainly summer here in Gibraltar, someone has turned the thermostat up on the heating and we’re cooking nicely. We have reached that delightful stage of the season where, in our non air conditioned apartment you stick to the chair if you stay in it for too long! Sorry for that image 😛 . 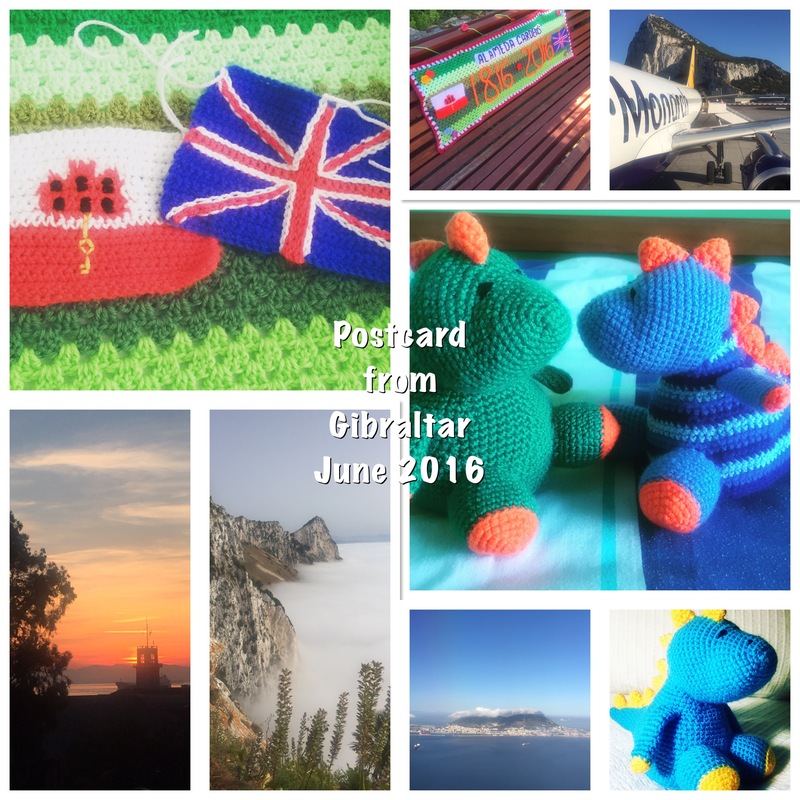 Here’s a little look back at what I’ve been up to this week. It’s very floral; flowers and gardens seem to have been a theme this week. I got back to my watercolour class this week after a 4 week break and it looks like my time off has had an effect. Not too happy with this offering, it either needs more work or a bin! We were working from a painting which my art teacher found on a greetings card. The original was really lovely – you’ll have to use your imagination I’m afraid. I love seeing these frangipani blooms when they open. As far as I am aware there is just one spot in Gibraltar where they grow. It’s on Queensway just next to Commonwealth Park. Sometimes I park my car in the carpark next door to Commonwealth Park and I get to walk past these beauties coming and going from the car. They really are stunning at the moment – so tropical looking. I’m really making headway with my final skirt at my dressmaking class. As you can see from the photo the waistband is going on. Unfortunately, when I tried it on the front pleat sat right on top of my stomach, drawing rather a lot of attention to it (not a good look), so I have had to unpick the front to adjust the pleat. Hopefully I’ll get the skirt finished next week as it’s our last lesson of the academic year. We have had a few school friends round to play in the afternoons this week as all the government schools in Gibraltar are on half days (finishing at lunchtime). I have to admit that I’m struggling with it a bit this year. There is always a ratcheting up of stress levels as the school year comes to a climax with sports days, beach days, pyjama days, parties and concerts and all the associated outfits and rehearsals which go with that. Put that on top of the usual jobs you have to do but with only 3 hours each week day child free in order to do it, I have to admit I’m shattered. How parents who work for a living manage I have no idea. This week was week 3 of 4 half day weeks so I’m almost on the home straight. Each little Postcard had a friend over this week to help make the afternoons run a little smoother (read sibling tension here). 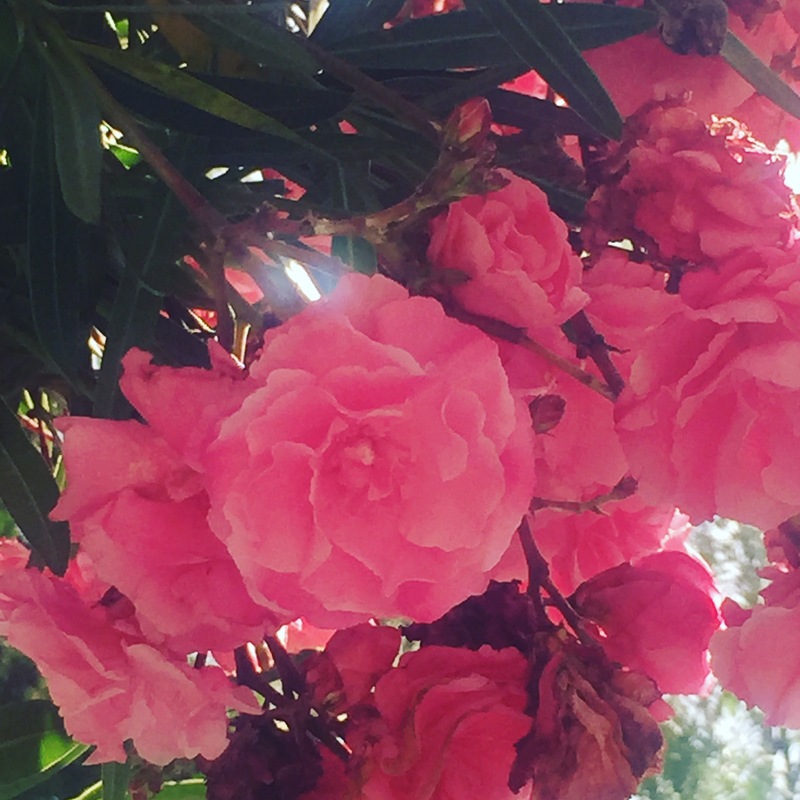 One day we went to the park for a while before heading home for lunch and I found myself gazing up into the beautiful pink blossom of the oleander trees above. Aren’t they just beautiful? They have frilly double blooms and remind me of the dresses the ballroom dancers used to wear on Come Dancing when I was little. It was such a delight to see them, a real moment of stopping and taking a deep breath in amongst the chaos of our current weekly routine. Summer time generally means spending more time outdoors and our poor patio has been neglected of late. There is major construction work going on in the building directly behind ours so there is noise and dust from about 7:30am until at least 6pm on week days. That and having an audience of builders in hard hats looking down on you kind of puts you off having a cup of tea in the yard during a quiet moment. I took a bit of time while the builders had downed tools to have a potter this week. 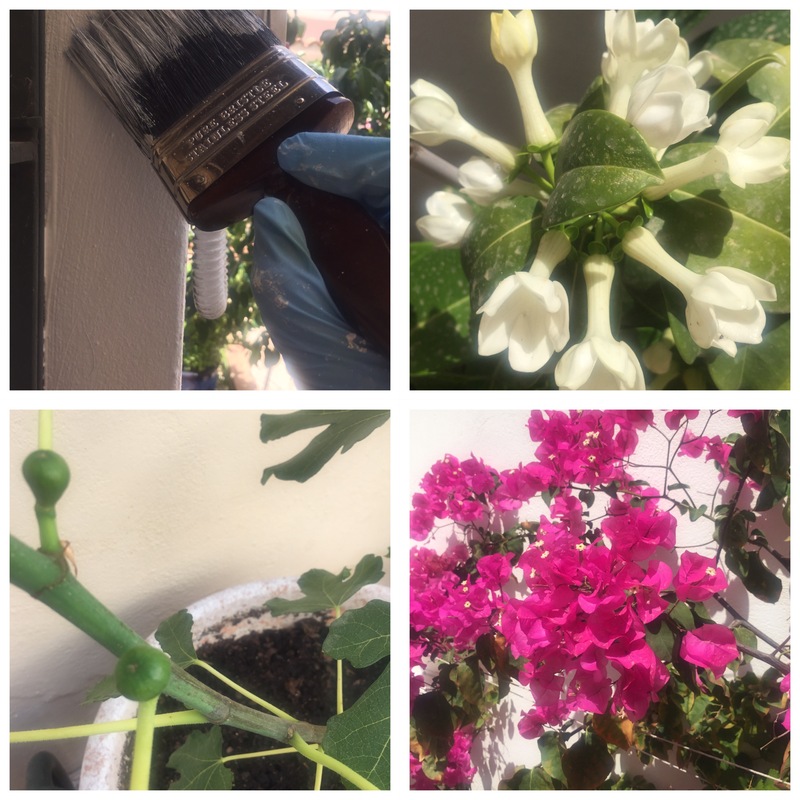 I painted a wall – it looks lovely and bright in the sunshine now – especially against the bougainvillea. We have had mixed results with our trees this year. Our lemon and orange trees have blossomed twice and had baby fruits on them but they shrivelled up and fell off. Our new almond tree looks dead too so that’s not so good either, but Mr Postcard pointed out that we have baby figs growing on our little fig tree so we’re happy about that. The stephanotis is looking good too with it’s white blossom, the leaves are a tad dirty in this photo due to the thunder storm we had this week which brought loads of Saharan dust with it. On Friday evening I took the little Postcards to Queensway Quay to meet Mr Postcard for an after work drink and dinner. 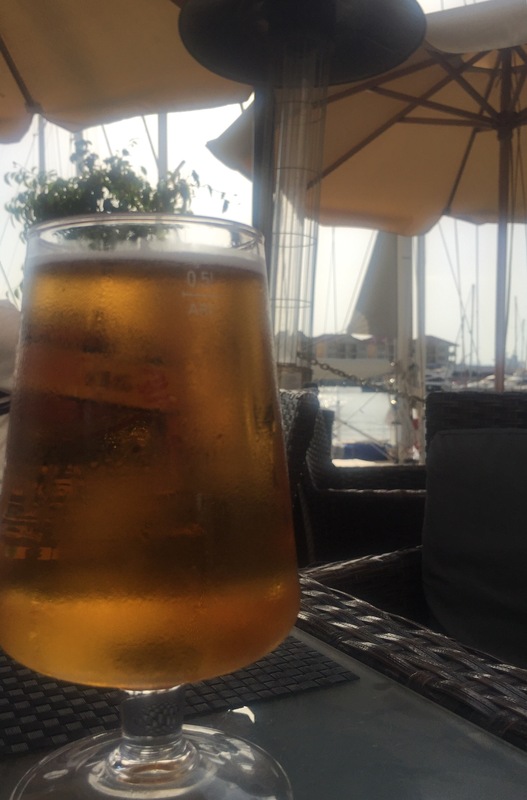 That pint of San Miguel really hit the spot after such a busy week! We made our usual Saturday trip into town yesterday, we had a few bits we needed to buy for the week ahead. 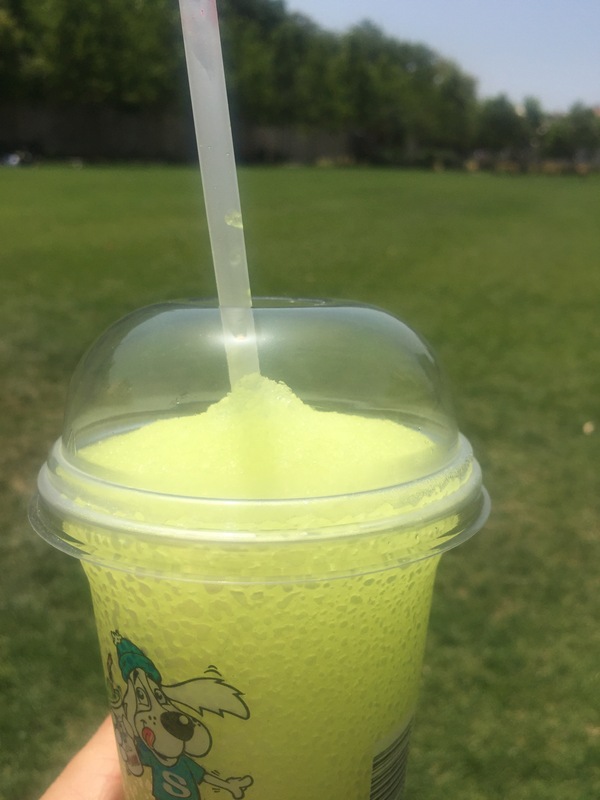 On the way back to the car we all had Slush Puppies and went to sit in Commonwealth Park. The park was almost empty (as you can see) I reckon most of Gibraltar had gone to the beach. We sat in the sun slurping happily and watched the little Postcards doing roly-polies down the hill. Sunday Sevens is a weekly blog series featuring seven photos from the last seven days. The series was the brainchild of Natalie at Threads & Bobbins, if you fancy joining in check out Natalie’s blog for more details. Love all of your flowery adventures. I’m so jealous, you have a summer. We are still suffering rain, wind and cold conditions. It’s so miserable, when will it end. Thank goodness you cheer me up, your bright, colourful and cheerful blogs are a joy. What a lovely week – well apart from the skirt. How annoying. Those frangipane flowers do look as if you could eat them. 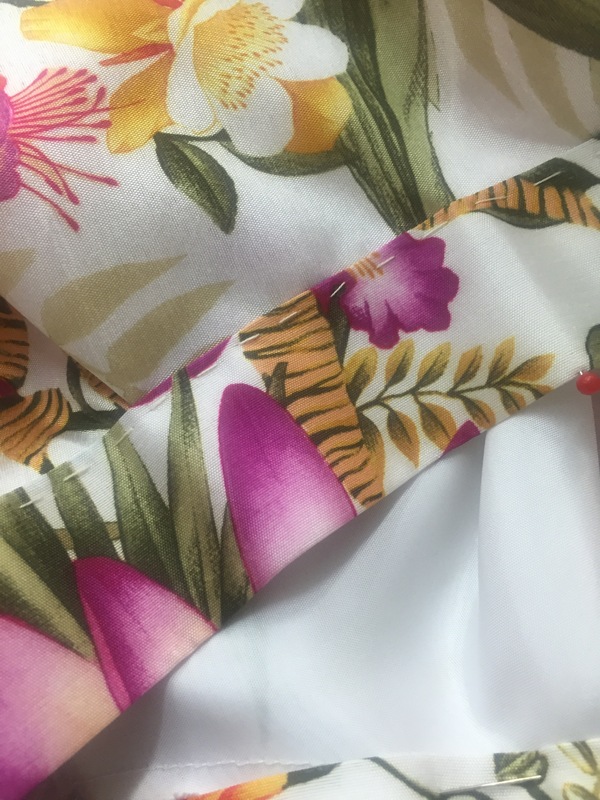 Your skirt looks just as tropical as your surroundings, it will be beautiful! Hopefully you’ll be able to enjoy your patio very soon. Thanks Jen :-). At least we can make the most of it at the weekends, we are fortunate to have that as outside space is rare in Gibraltar. Thanks for the comment ! Gorgeous flowers everywhere – even on the skirt! 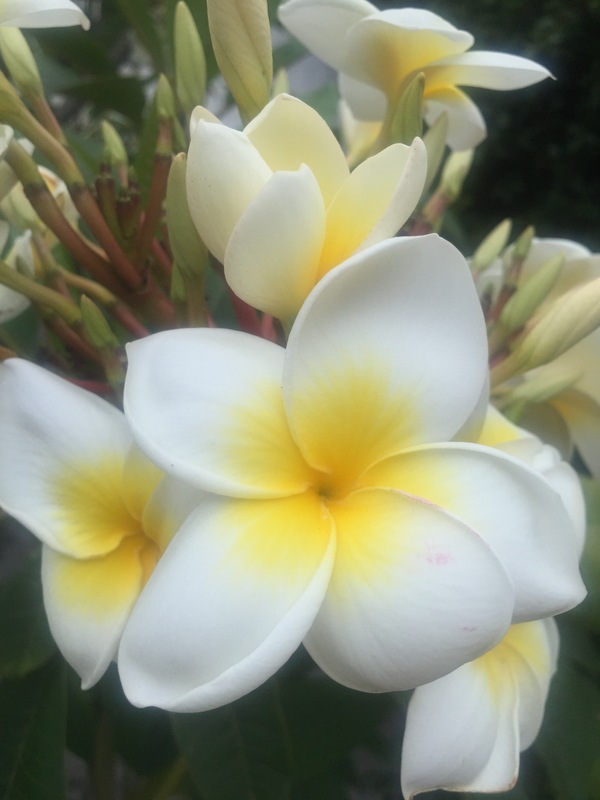 The frangipanis are just so beautiful. 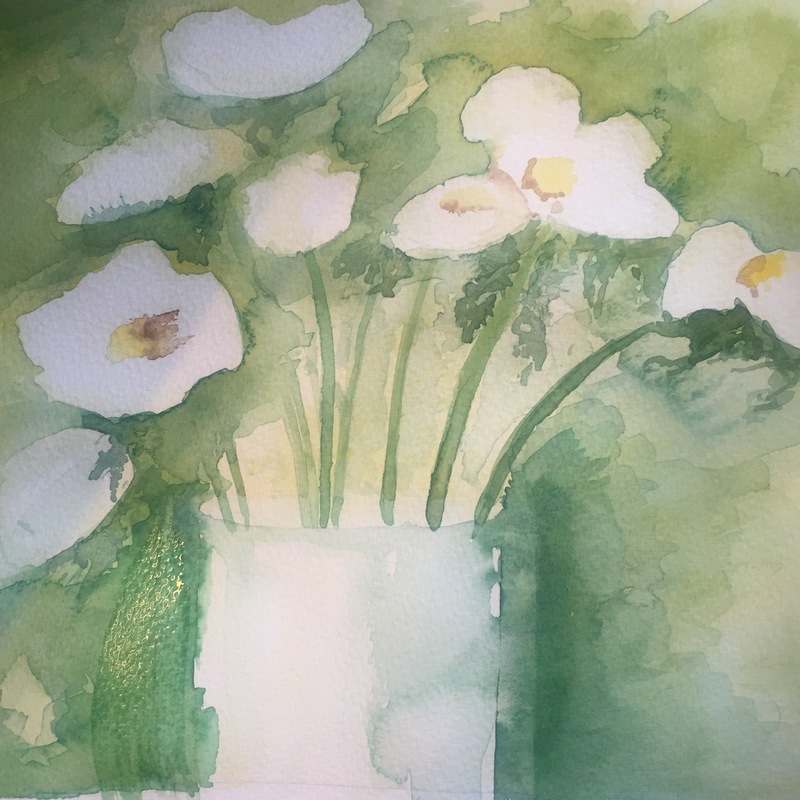 Hoe you get your painting mojo back soon, although it looks alright to me….